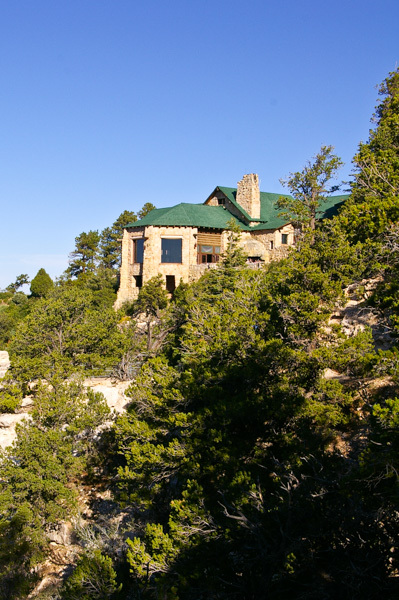 After a long roundabout trip from Rim to Rim, we arrived at the Grand Canyon Lodge. 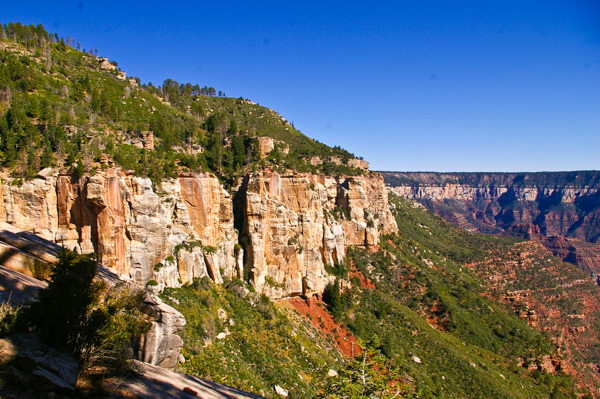 There is no "village" such as found at the South Rim. No shuttle buses or paved drives along the cliffs. 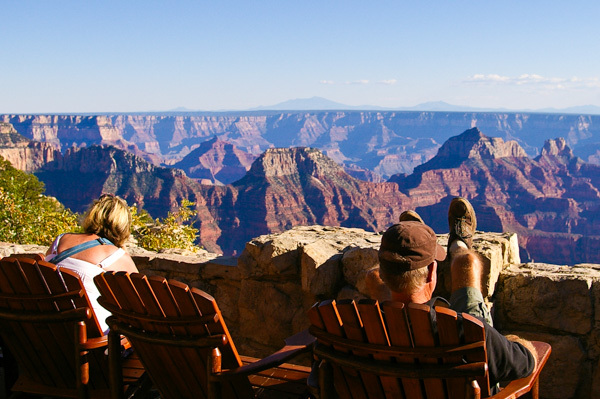 Only about 10% of the visitors to the Grand Canyon come to the North Rim. To put that into perspective, however, that is 10% of about five million visitors – "only" 500,000 people. 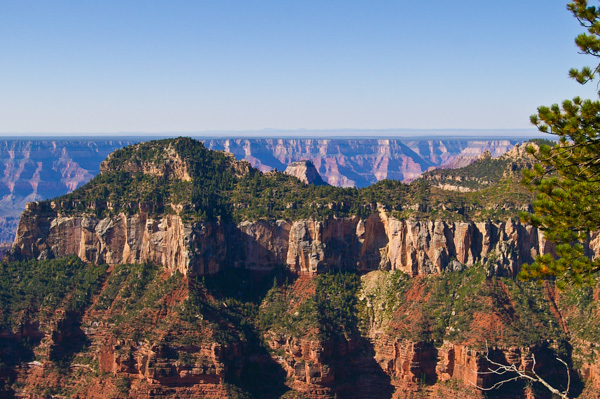 And since the North Rim is only open six months of the year due to heavy snowfall, that means that it isn't exactly empty of tourists. Nevertheless, it is far less commercial and even more dramatic. Jim in front of our cabin. More precisely – our half of the cabin. The Yavapai lodge, where we stayed on the South Rim, was much more like a typical motel. Here everyone stayed in cabins (or in campgrounds). We were very lucky in our room – it was almost on the rim itself. In the picture above, Jim is standing in front of our cabin. You can see a cabin to his right. This is what is on the other side of that cabin. You wouldn't want to trip coming out of the door of one of these cabins! Or, as our guide Bruce pointed out, it was no place for sleep walkers! Just past the fallen tree was the precipice. 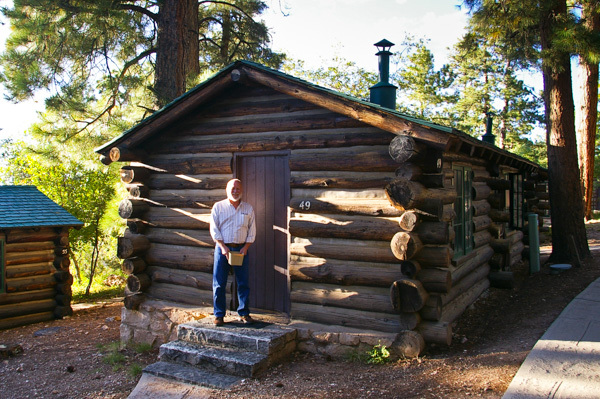 All of the guest rooms at the North Rim are in cabins. The main building contains the lobby, restaurants, saloon, and various other facilities. It was built right on the rim. This structure dates from 1936 and replaces an earlier one that burned. 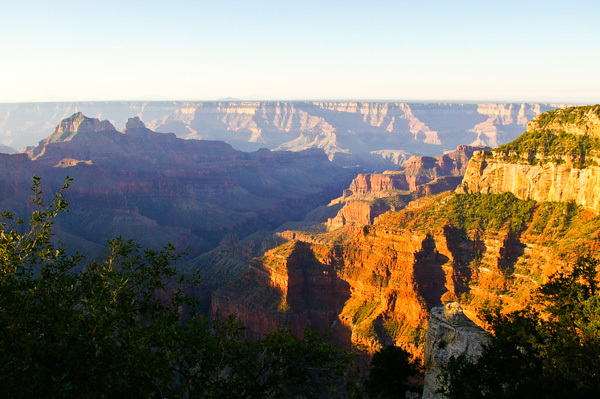 The design of the facility is such that visitors do not see the canyon as they approach it. Not until they step into the lobby do the wide picture windows reveal the stunning view. And this is that view from one of the patios adjacent to the lodge. The South Rim village location is not in this picture. It is off to the right. I can't begin to summarize the various rock layers within the canyon. Check the link for details. 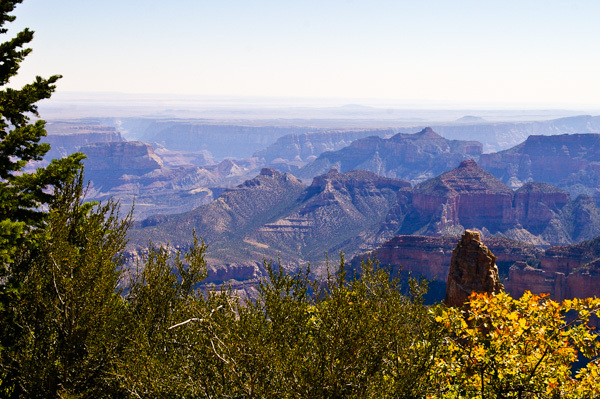 This picture gives an overview of how the canyon is growing. Briefly, the vertical layers are harder rock than the sloping layers. As the softer rock erodes from wind and water, the base of the harder rock is undercut. Eventually, some of it will slough off as is shown in the center of this picture. The lighter-colored rubble came from the cliff above. This process slowly widens the canyon. Another gorgeous sunset in the canyon! This picture also shows another common erosion pattern. In the distant past there had been a peninsula jutting into the canyon where this ridge is now. Gullies developed where the "saddles" are seen. The same process as above ate away the upper layers. The peninsula where the lodge is now located will look the same in the future – but none of us will be around to see it. I was waiting in the cabin for Jim to return from a history hike when I heard a scuffing noise. I looked out and saw this little critter digging around the cabin. 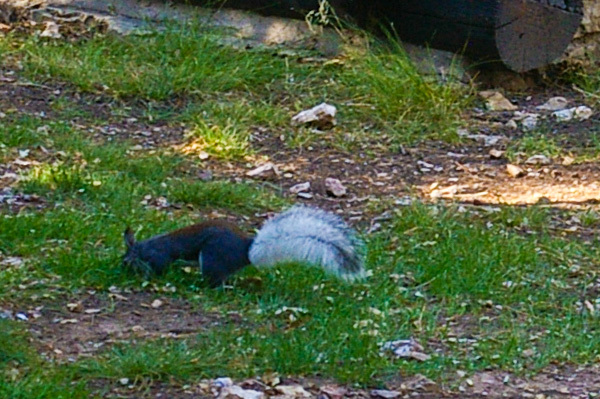 The Kaibab Squirrel is unique to this plateau. It is a subspecies of the Abert's Squirrel and is dependent on the ponderosa pine forest for its home and sustenance. In the morning while Jim went on his history hike, I went on a nature hike with one of the park rangers. She pointed out numerous geological features and how they affect the plant life. The vegetation on the top of this ridge includes cholla cactus, normally found at much lower elevations. Because of the sun exposure and the warmth of the canyon interior, however, here it is found at over 8000 feet. On the lower level in the shade of the outcroppings, Douglas Fir is growing in a cool micro-climate. One of the interesting exercises that our ranger gave us was sniffing ponderosa pines. Some thought the smell was like caramel. Others guessed vanilla – or chocolate. Nevertheless we looked like a bunch of weirdos for the rest of the hike getting up close and personal with the pines. 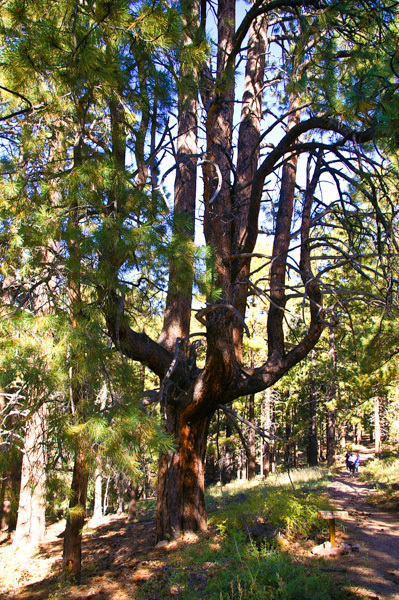 Toward the end of the hike we saw this unique candelabra-shaped tree. The ranger didn't know why it had taken this shape. The yellowish bark shows that the tree has some age on it. Later that morning we piled back into the bus for an expedition to Point Imperial. This is near the place that the narrow Marble Canyon, which we will visit later, opens up into the "grand" scope. 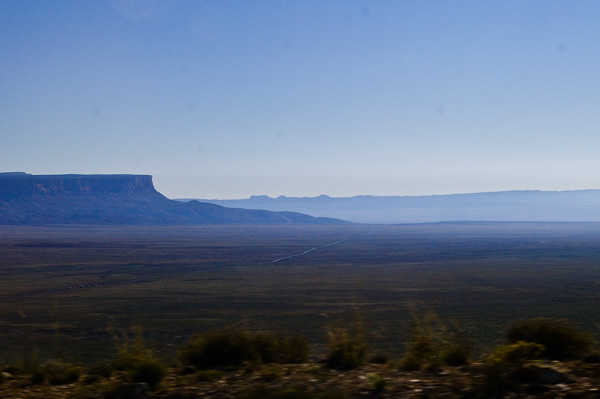 The view over Saddle Ridge east toward the Vermillion Cliffs, which may be seen in the distance. An earlier picture, taken from the lower-lying plain, showed this same notch feature from the other side. Again we are faced with the questions of how and why the river cut a deep canyon not only across the plain in the distance, but also through this massive uplift. One theory is that in the distant past the river actually flowed northeast instead of its current southwesterly direction. The only link that I could find that summarized the controversy well has since vanished. It's complicated. While munching on our box lunches at Point Imperial, we were saluted by a loud "AH-OOO-GAH." 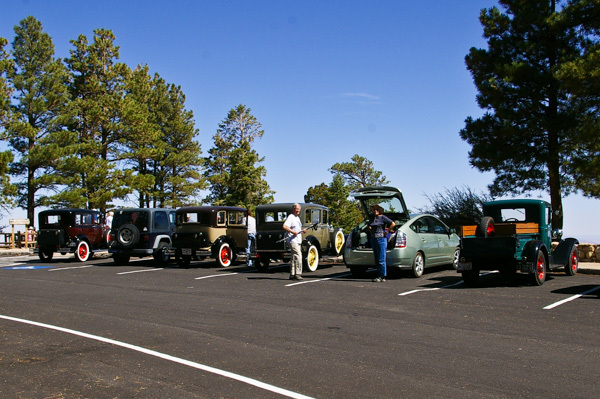 Imagine our surprise when a caravan of Model A cars (and one truck) came chugging up into the parking lot. This Utah car club travels extensively in their meticulously restored vehicles. Several had "This car climbed Pike's Peak" stickers. It gave us something else to ooh-aah over in addition to the scenery. 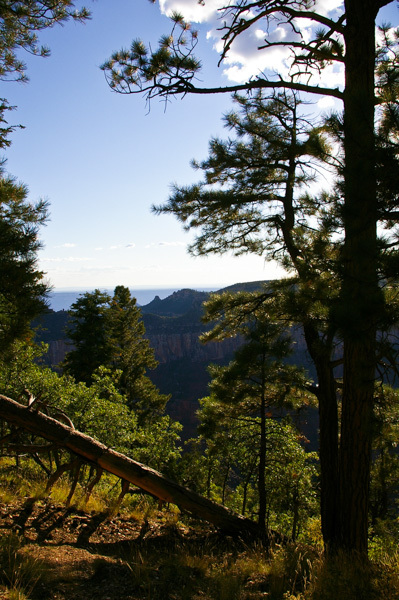 After returning to the lodge, Bruce led several of us on a hike down part of the North Kaibab Trail to the Coconino Overlook. We had to keep in mind that what goes down must come back up. The trail was steep and the air was thin at this high altitude. On our way we met some rim to rim hikers who had started at 4am that morning from the south rim. They were looking forward to the completion of their ordeal. This activity is not for the faint-hearted or the unprepared! 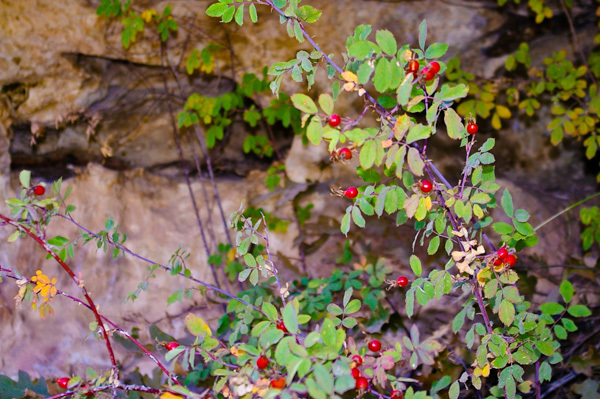 I saw several roses with their bright red hips down in the canyon. Because of the great variety of microclimates due to soil and altitude changes, there is a great variety of plant life. Let the mule do the heavy lifting! While we waited for stragglers in our group, a mule train came out of the canyon. 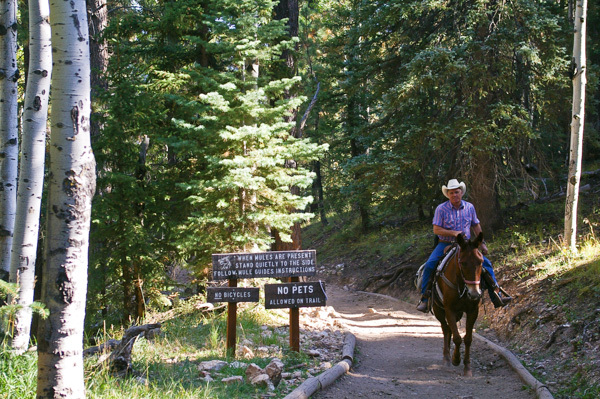 We had seen plenty of, ahem, evidence of mules on the trail and we had heard them behind us as we climbed back up. I was very happy to reach the top before they caught up with us so I didn't have to get off the trail to let them pass. Most of the trail was considerably narrower and steeper than seen here. Our bus was leaving early the next morning for the long trip to Phoenix so we got up with the sunrise. It was a special time to sit quietly and watch the changing shadows. The sunset vigils could get pretty boisterous, but in the early light everyone spoke in hushed tones. Descending from the Kaibab Plateau onto the comparatively lower levels of the Colorado Plateau. The escarpment of the Vermillion Cliffs loses its characteristic color in the morning light. These cliffs are the first "step" in the Grand Staircase-Escalante National Monument that extends into Utah. 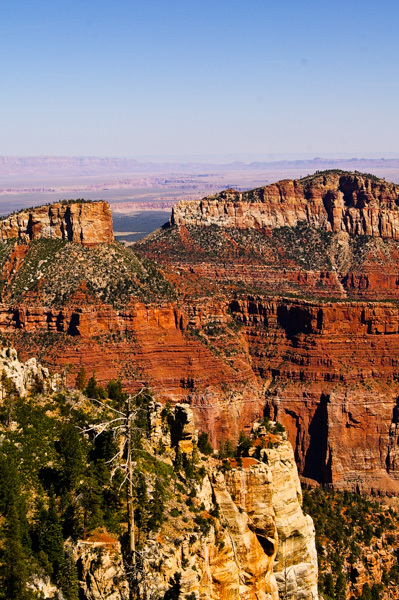 Many eons ago the Colorado Plateau itself may have been a canyon. Who knows? 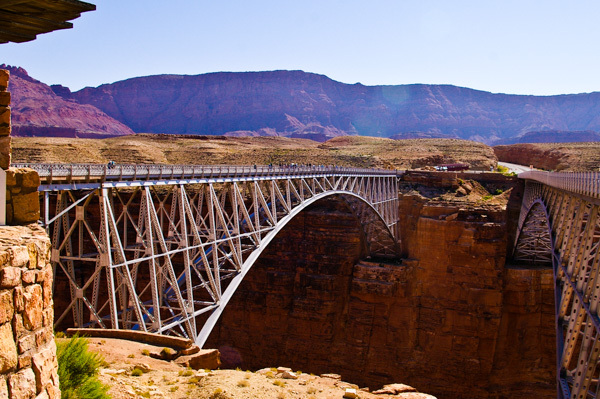 We crossed the Colorado at Navajo Bridge not far from the Lee's Ferry crossing. The old bridge on the left is open only to pedestrian travel. At the time of our visit it was hosting an enthusiastic party of bungee jumpers. I've never seen the appeal of this activity myself. It isn't really dangerous and it takes no real skill so what's the point? 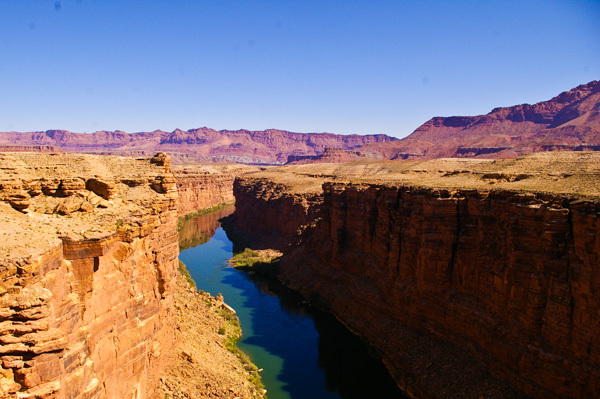 Major John Wesley Powell, who led the first exploring party down the Colorado River, named many of the features including this one, Marble Canyon. The Navajo bead shop at the far end of the bridge was much more dangerous for our group (or at least their pocketbooks) than bungee jumping. But the Cameron Trading Post stop was even more hazardous for yours truly as I purchased a Navajo weaving. 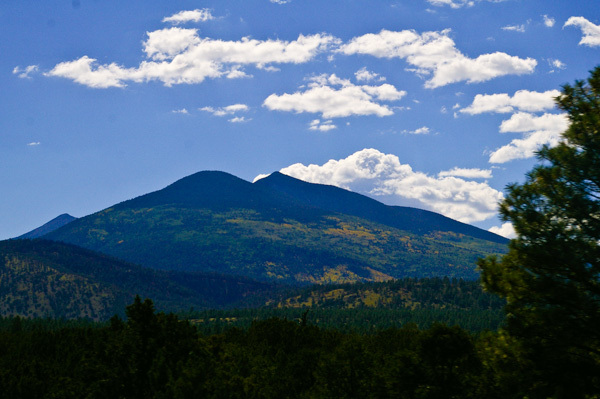 As we traveled south toward Flagstaff we skirted the San Francisco Peaks. 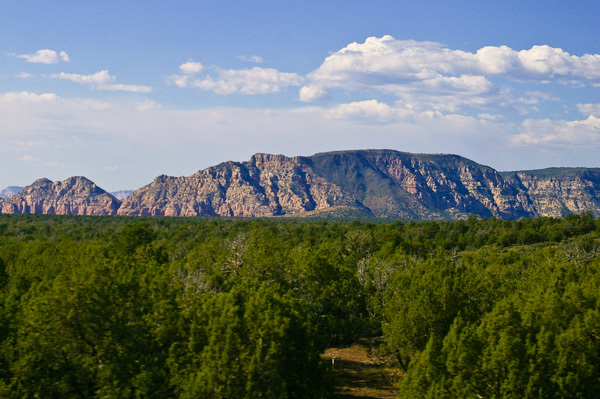 These are volcanic mountains and are the highest elevations in Arizona. 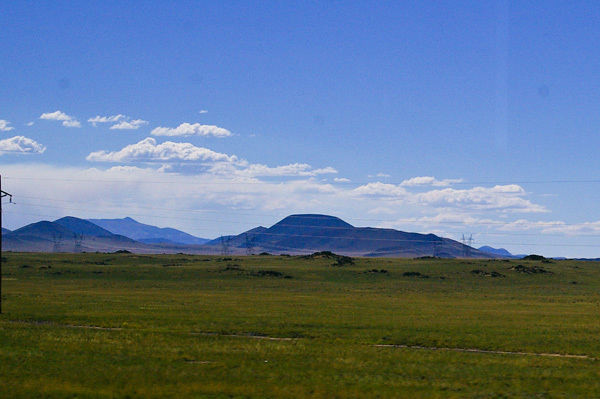 You can see remnants of old lava flows in the grasslands. A closer view of the peaks. The aspens are showing their fall colors. We went into Flagstaff to pick up the couple who missed the latter part of our trip due to a medical emergency. 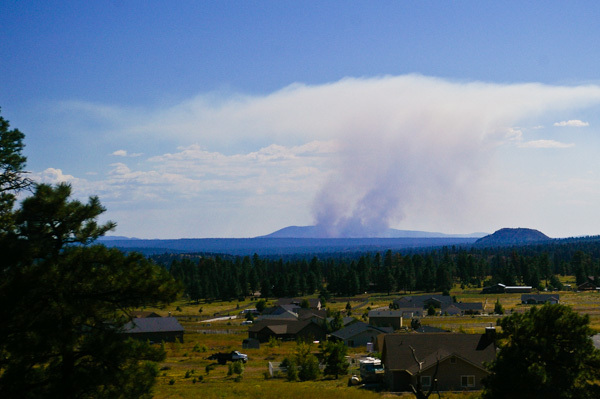 The fire pictured here was a "healthy" fire that was under control and doing its part to renew the forest. A fire earlier this year had not been so benign and had caused a lot of damage – primarily as a result of flooding caused by runoff from the burned over land. We have left the Colorado Plateau by way of a large lava flow down the side of the escarpment. Interstate 17 uses this route. 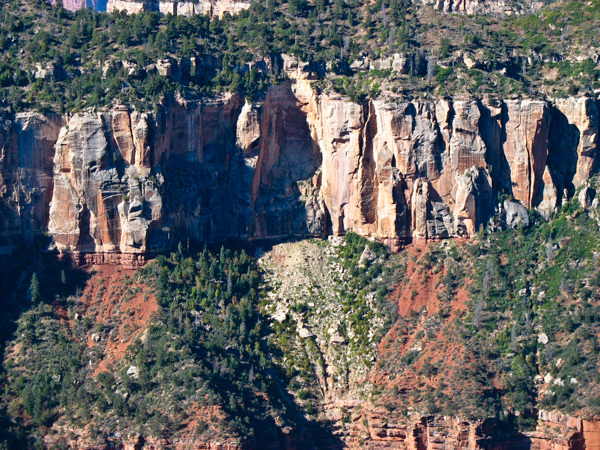 A smaller flow can be seen on the side of the cliff here: the dark colored ridge. We are looking forward to heading home. Chuck was our capable driver throughout the trip. 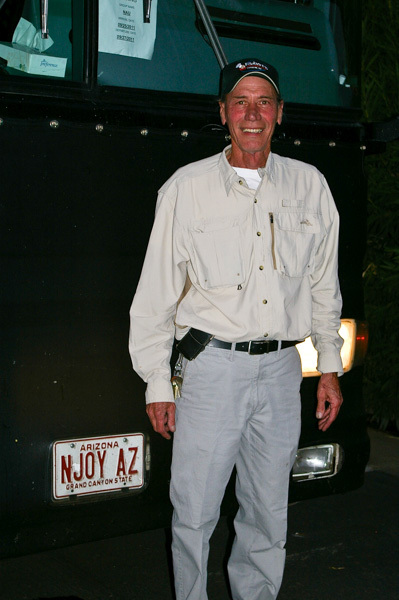 We had to get a picture of him and the bus with its appropriate vanity tag. This was his last trip before retirement! 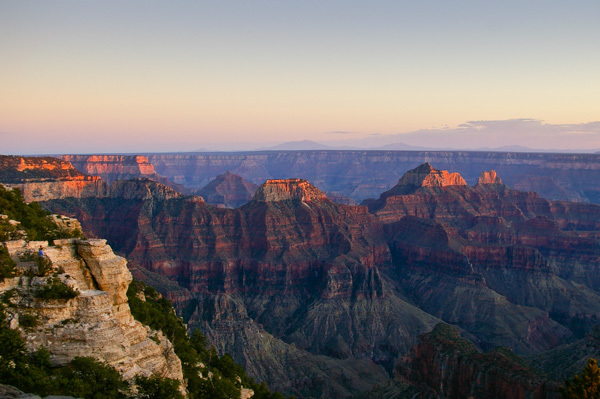 The Grand Canyon is spectacular, but it's always great to get back home. 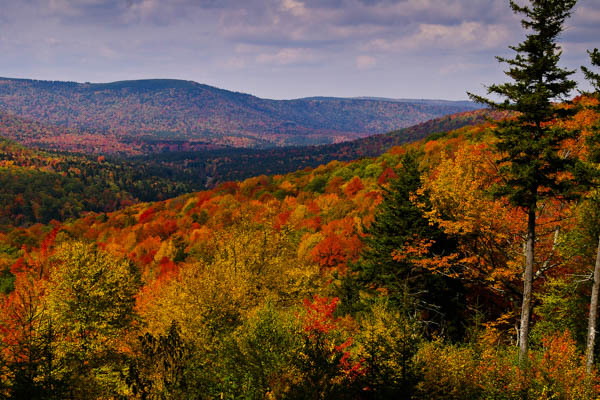 The existing Appalachians may be mere nubs of their former heights, but they are as beautiful as anywhere else on the planet.